Global Lounge Mission:Global Lounge builds culturally infused communities through preservation, education, engagement and mentorship in the arts and humanities.Through engagement, interaction and inclusiveness we promote a viable integrated multicultural community.We are a 501(c)(3)Non‐profit organization established in 2006. Although Global Lounge is present year around, working with small grass roots organizations such as Escuela Flamenco, they have a yearly summer festival called World Village, where they gather every culture community and nation possible to represent in a weekend long festival in front of the Boise Capitol building. It is worth going to, donating to, or volunteering at. From one drop of water to the entire bucket…. Escuela Flamenco is a small organization with an administration of one. The One writing this blog. From this Ipad, or Android phone, this ‘Administrative of One’ blogs, vlogs, emails, submits to festivals, submits to grants, manages Flamenco artists in Spain and in the USA, collaborates with other Flamenco organization coast to coast, budgets, manages projects and fundraises. Escuela Flamenco-Administrive One for ONE cultural movement dedicated to One specific culture who’s roots reside in a ONE very specific area of Spain that is about the size of Boise. Spain itself, is no bigger than the state of Texas. Now, lets attempt to imagine the scale of Escuela Flamenco Administrative One against Global Lounge Inc who is an open door to ALL grass roots, folkloric, traditional, direct from source, mostly immigrant based businesses like Escuela Flamenco. Now we have gone from ONE pin point area to several hand fulls upon hand fulls of pinpoint cultures in the WORLD that reside here in the Treasure Valley. What does a job like that look and feel like? What kind of grit and compassion does does an organization have to have to topple all of the challenges that encompass a world of differences and delicate harmonies? How strong does a heart have to be and how deep the soul to truly move forward with integrity for every little pinpoint culture that exists here in this Valley, in this State of Idaho? Only the team that is active in this organization could help us understand. We hope to catch up with them soon for an interview…stay tuned…. With many world cultures in a small space, harmony does not come with out challenge, without striving to work together. Guidance is usually needed. Conflict resolution. A gentle knudge for differences to be resolved so that we can have a beautiful co-existence thus, enriching the thriving community of Boise and the larger Treasure Valley. Their beginning in 2006 simply was a table at Hyde Park Street Fair with Dayo and wife Donna bringing public awareness of the diverse immigrant-based cultural activity happening in the Treasure Valley. Today a team, eclectically comprised of Boise leaders and art activists, is lead by Dayo Ayodele. Every year’s hard work is celebrated with the World Village Festival. Escuela Flamenco met with Dayo in 2012. We kept in contact as we slowing organized EF. Later, with Dayo’s help, found a platform and space for classes at the International Market. After the heart breaking fire that took down the International Market, Dayo as representative of Global Lounge was on the phone with Escuela Flamenco, brainstorming what we could do to keep classes going. 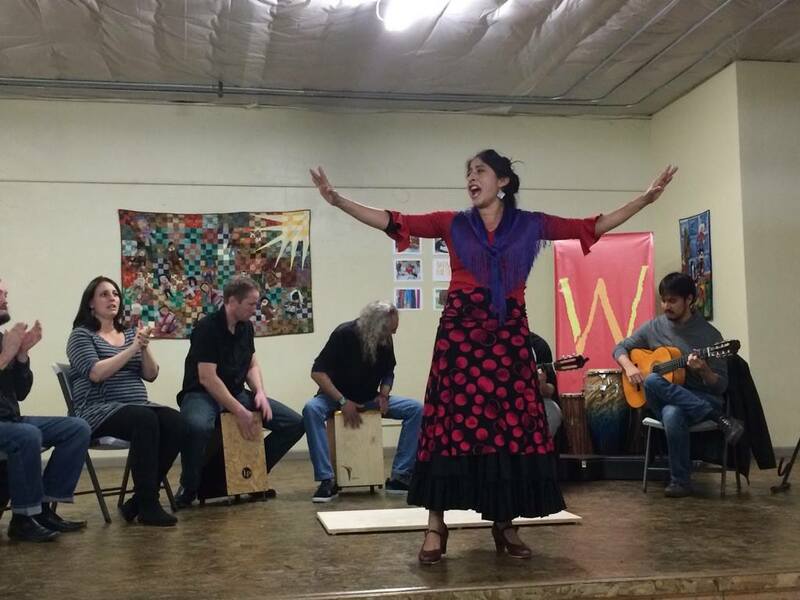 A grass roots business such as Escuela Flamenco will always face challenges, but thanks to Global Lounge, we know that bringing our folkloric art to the community is appreciated and supported. We can rest assured that there is an ear to listen, wise experienced words to get feedback, and patient moral support. For this, Global Lounge is not only our hero for 2016 but also a friend organization that we would gladly return Flamenco energy and passionate support to every year, all year. HEY! This link gives a taste of World Village Festival, a weekend long event produced by Global Lounge. You can find Escuela Flamenco: Shimi Tree performing in the report. Just one tiny culture sharing and happy to be performing alongside many other cultures. Show up for your first class and try it for free!